CRAZY DISCOUNT! Was: $169.95 Now: $49.88! Store your shoes neatly and orderly in our Black Shoe Cabinet Rack. Designed with generous space, the shoe cabinet will accommodate up to 17 pairs of shoes easily. The shoe rack comes with two doors to protect your heels, sandals, sneakers from dust and mildew as well as five open shelves to keep the most commonly used shoes or objects within reach. Its ample top surface is perfect for displaying plants, crafts and other items for home decoration. 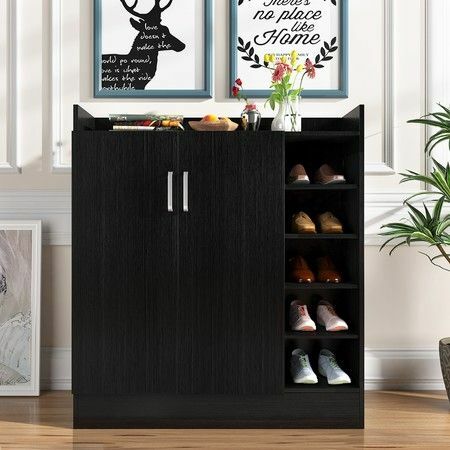 Furnished quality particle board with chic black finishing, the shoe organiser is built to last in your porch, living room and even mudroom. Order the shoe shelf to upgrade the overall look of your home now. Not enough info on how to assemble. Pretty good.